The Islamabad High Court issued the protection order for the girls on Tuesday, saying it acted on a petition from the two. It also placed their husbands under protection but in a separate shelter, as they purportedly fear they could be attacked by the girls’ parents. Pakistani media have cited the girls as claiming they were married of their own free will. Their lawyer, Mohammad Umari Baloch, claims they are not minors, contradicting the family’s statements. The girls’ family, from the Sindh town of Ghotki, says the sisters are 13 and 15 years old and were abducted and forced to convert and marry the men. The sisters’ elder brother, Shaman Daas, said they were taken as the family was celebrating the Hindu annual festival of Holi last Friday. “Their marriages should not have been performed and not by a Muslim cleric,” Daas told reporters. The Islamabad court said it would take up the case next Tuesday, after the probe is completed. The sisters’ parents are expected to attend the hearing. 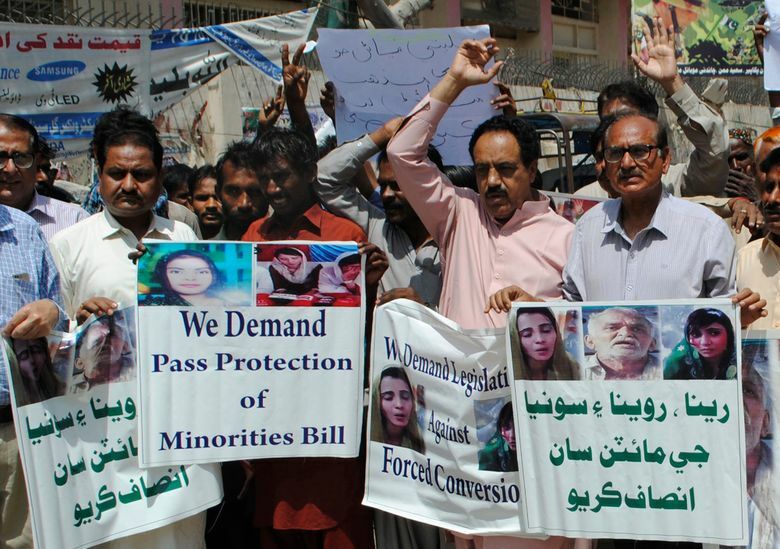 The province’s parliament, the only one in Pakistan that has taken any action on forced conversions, failed to pass the bill banning it in 2016. “At present, forced conversions are too easily – and too often – disguised as voluntary conversions, leaving minor girls especially vulnerable,” the commission said.